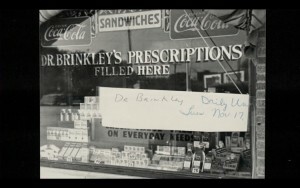 Brinkley indeed had this “network of druggists”: the Brinkley Pharmaceutical Association, who stocked Brinkley medicines. People who listened to Medical Question Box would be told which medicine to take for what ailment, and they could visit any number of “official” Brinkley medicine purveyors to buy them. "Pepping up Kansas" (The Decatur Herald, 28 Apr 1930, Mon, Page 6); "Tells of Filling Prescriptions as Given Over the Radio" (The Sedalia Democrat, 21 May 1930, Wed, Page 11); “The Wizard of Milford,” Francis Shruben, Kansas History 14 (winter 1991-1992) p. 230.